Here is a summary of all the big happenings of the past two weeks! Life is as busy as ever, plus I am working on several great projects I am really excited to show to you when they are done. As always, I enjoy your feedback, and I hope you enjoy this post! Cinifex's spring edition will feature an article on The Hobbit: The Desolation of Smaug. Read a short teaser at TheOneRing.net. Bringing "Smaug" to Life: a video from Weta Digital on the creation of Smaug, released exclusively to The Hollywood Reporter. The Hobbit: The Desolation of Smaug received eight Saturn nominations: Best fantasy film, Best supporting actress (Evangeline Lilly), Best director (Peter Jackson), Best writing (Fran Walsh, Philippa Boyens, Peter Jackson and Guillermo Del Toro), Best production design (Dan Hennah), Best music (Howard Shore), Best make-up (Rick Findlater, Richard Taylor, Peter King), and Best special/visual effects (Joe Letteri, Eric Saindon, David Clayton and Eric Reynolds). 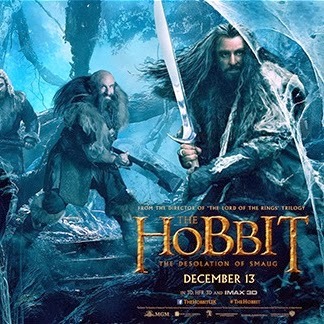 The Hobbit: The Desolation of Smaug received seven Empire Awards nominations: Best Sci-Fi/Fantasy, Best Film, Best Director – Peter Jackson, Best Actor – Martin Freeman, Best Supporting Actor – Richard Armitage, Best Supporting Actress – Evangeline Lilly, and Best Male Newcomer – Aidan Turner. Don't forget to vote! Creating a Waterlogged Action Sequence: a video from WIRED about the making of the barrels scene. Download a demo of the new Lego The Hobbit video game, narrated by Christopher Lee! Also check out the new trailer. The Hobbit: The Desolation of Smaug received four MTV Awards nominations: Movie of the Year, Best Hero (Martin Freeman as Bilbo Baggins), Best Fight (for Orlando Bloom and Evangeline Lilly vs. Orcs), and Best on-screen Transformation (Orlando Bloom). Don't forget to vote!